The Bridges to the Future Campaign will enable a number of much-needed projects to be completed. Just over a decade ago, Adventure Unlimited launched its first capital campaign. More than $11 million was raised to build new needed facilities, renew existing facilities and expand programs. In addition, the overall infrastructure was addressed, and the Field Program evolved into DiscoveryBound – significantly expanding its geographic reach and offering year-round programs for Christian Science youth. More recently, the DiscoveryBound National Leadership Council (NLC) was launched. 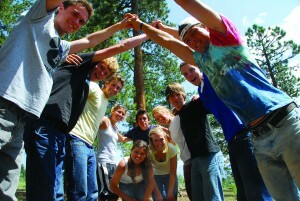 The NLC is the first newly created national program for Christian Science youth to emerge in decades. The program is dedicated to fostering spiritual growth, leadership qualities, and a service approach to life that helps to guide and prepare teens as they enter adulthood by giving them tools to act as leaders. The Bridges to the Future Campaign will focus on the following areas, ensuring the future of Adventure Unlimited and DiscoveryBound for generations to come. Please click on a Campaign area below to learn more about these needs. Ready to help? For information on how to make or direct a gift, you can give online or call 888.416.7348 x109 or Email.